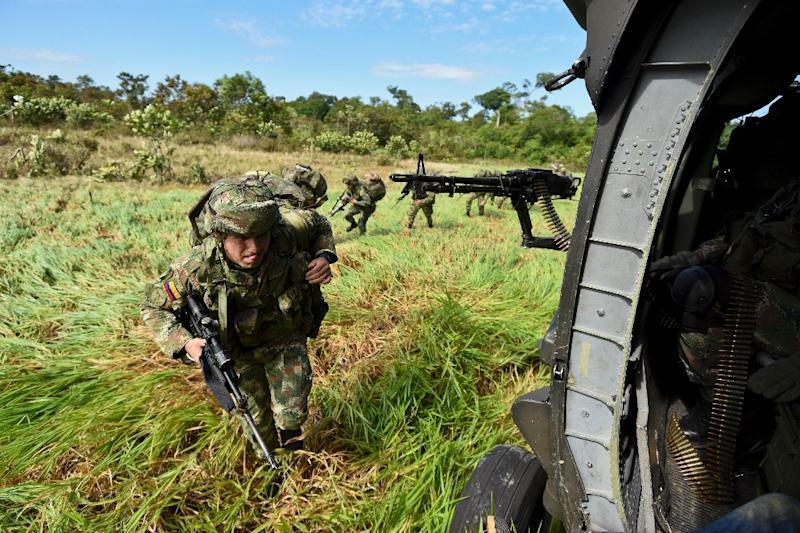 Bogota (AFP) - The Colombian military has killed seven leftist guerrillas and captured an eighth in an operation near the Venezuelan border, President Juan Manuel Santos said Saturday amid a sharpening conflict with the country's second-largest guerrilla group. Santos said the guerrillas belonged to the National Liberation Army (ELN), which has been in preliminary discussions for two years with the government about joining formal peace talks. Tensions have risen sharply, however, since February 3 when the group captured a Colombian soldier. "If they want to begin some kind of public conversation, they have to free those two kidnapped people they are holding," Santos said, referring to the captured soldier and a civilian who has been in rebel hands since 2014. "There will be no step toward a negotiation if they do not at a minimum fulfill these conditions," he said in a speech to the leadership of the National Police. The seven ELN guerrillas were killed Friday night in Arauca, a region that borders Venezuela, Santos said. The operation followed a three-day ELN offensive aimed at disrupting traffic on major roads. Three police were killed and dozens of violent incidents were reported across the country from last Sunday to Tuesday. The army had put itself on "maximum alert" in anticipation of more violence on the 50th anniversary, last Monday, of the death of Camilo Torres, a rebel priest who was an early leader of the ELN. Founded in 1964, the ELN is the country's second-largest guerrilla group, with an estimated 1,500 fighters. Colombia's largest guerrilla group is the FARC, or Revolutionary Armed Forces of Colombia, which has been in formal peace talks since November 2012. The FARC and the Santos government have pledged to reach a final peace agreement by March 23, but negotiators have yet to agree on details of a disarmament process and the mechanism by which a final accord will be ratified.